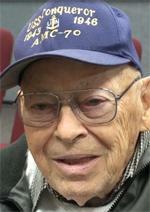 1943 Enlisted when he was 17 in 1943 into the Navy until 1946. Was USS Richard P Larry DD664, next USS Conqueror AMC-70 which was a minesweeper. Ship was 120ft long with 18 people onboard, made out of wood and with an 8ft draft. Guarded the Panama Canal from German submarines. Best way to destroy was to use anti-aircraft guns which was twin 50 caliber machine guns.